Quickbeam, originally uploaded by gjtramey. From one of my Flickr and RBW group friends. 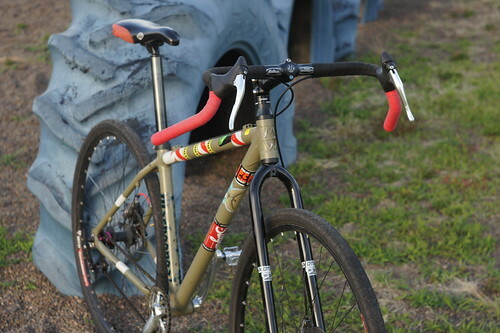 I like his gear spread for a go-anywhere fixed gear bike. 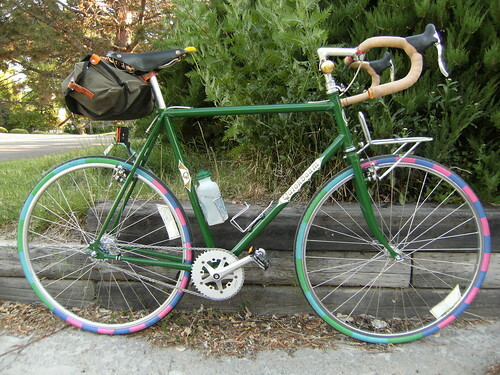 He’s using the Surly Dingle double-fixed cog and some larger rings than the stock Rivendell setup. I’ve migrated toward larger rings on road cranks, too, but I like his 23t flip cog better than a 15t cog. That’s a beautiful spread. He can drop from 72″ to 50″ without taking the wheel out of the dropouts. Flipping the wheel, his biggest and smallest gears have the exact same axle position. Running the numbers, we can see that he must be using 32mm tires. And, uh, plus we can see them. 38 or 40mm tires will give slightly taller gears. Figuring your gears is a little tricky with a two-speed hub that shifts by itself. The low gear is 1:1, the high gear is 1:1.36. The low gear is direct-drive. There’s no fussing; the gear you calculate on Sheldon’s gear calculator is the actual low gear. It is the 1:1 gear. The high gear is 36% larger. I plugged in larger cog sizes until I got ones about exactly 36% larger. I just noticed that Sheldon’s calculator will let you add fractional cogs! I’m a double idiot – I just noticed that Sheldon’s gear calculator lets you choose a “Sachs Duomatic / Automatic” hub in the Internal Gears dropdown. This way is a little easier to read, though. I have a 19t sprocket, and a 22t sprocket. I also have 39, 40 and 42 tooth chainrings I think might work for this project. The “high gear equivalent” for the 19t is 13.97 (let’s call it a 14). The “high gear equivalent” for the 22t sprocket is 16.18. Again, 16 is plenty close. With a 22t cog and a 42t ring, I get my ideal setup: 52″ low and 71″ high gear. The Sachs Torpedo 2-speed gives a slightly wider ratio than my double fixed setups that use a 17/21 Surly dingle cog and a four-tooth chainring difference.